Odas Elementales and Canto General are under copy-right and are not included with this resource. “Oda al aire” and other poems of Pablo Neruda are easily found in textbook curriculum, anthologies and other collections of his works. A list of resources has been included for your convenience. 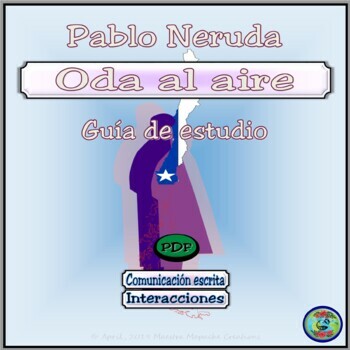 “Oda al aire” Study Guide is a stand-alone resource and will coordinate with other activities of your Neruda literary unit. If you would like other reading comprehension materials for your Pablo Neruda curriculum, please see my other related resources below. Maestra Mapache Creations has coordinated these collections of vocabulary, dialogues, worksheets and images to be your versatile tool for both verbal and written activities.